A total of seven incidents of armed robbery against ships were reported in Asia in July 2018. No piracy incident was reported. There was also no report of abduction of crew in the Sulu-Celebes Seas and no hijacking of ships for theft of oil cargo. In July 2018, a total of seven incidents (all actual incidents) of armed robbery against ships were reported. All incidents have been verified and reported to the ReCAAP ISC by ReCAAP Focal Points and Contact Point. Refer to the Appendix on pages 16-18 for the description of these incidents. Compared to the preceding month of Jun 2018, there has been an increase in the number of incidents in July 2018. Only one incident was reported in Jun 2018. 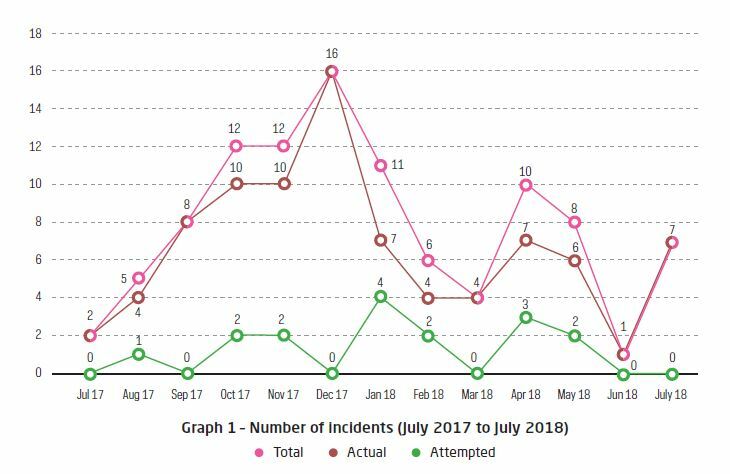 Graph 1 shows the number of incidents reported each month from July 2017 to July 2018. Of the seven incidents reported in July 2018, two incidents occurred on board ships while underway and five incidents on board ships at anchor/berth. 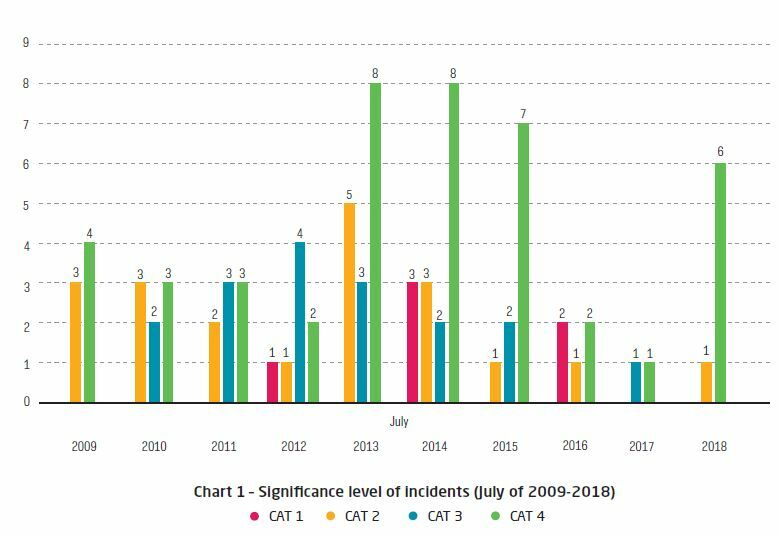 Of the seven incidents reported in July 2018, one was a CAT 2 incident and six were CAT 4 incidents. There were no CAT 1 and CAT 3 incidents. Majority of the incidents were CAT 4 (petty theft cases). Chart 1 shows the significance level of incidents reported in July of 2009-2018. A total of 47 incidents comprising 36 actual incidents and 11 attempted incidents, had been verified and reported to the ReCAAP ISC during January-July 2018. Graph 2 shows the number of incidents reported during the 10-year reporting period. Compared to January-July 2017, there was a 4% decrease in the total number of incidents reported during January-July 2018. A total of 49 incidents comprising 42 actual and seven attempted incidents were reported during January-July 2017. Of the 36 actual incidents reported during January-July 2018, three were CAT 2 incidents, eight were CAT 3 incidents and 25 were CAT 4 incidents. Chart 2 shows the significance level of incidents reported during January-July of 2009-2018. In comparison, the overall severity level of incidents reported during January-July 2018 was the lowest among the 10-year period of January-July. There was no CAT 1 incident reported during January-July 2018, and the number of CAT 2 incidents was among the lowest during the 10-year period. Majority of the incidents reported during January-July 2018 were CAT 4 (petty theft incidents), and this accounts for more than two-thirds of the total number of actual incidents. There has been an increase in the number of incidents in the Straits of Malacca and Singapore (SOMS) during January-July 2018 compared to the same period in 2017. A total of seven incidents (comprising five actual incidents and two attempted incidents) were reported compared to two incidents (comprising one actual incident and one attempted incident) reported during the same period in 2017. Of the seven incidents reported during January-July 2018, two occurred in July, two in May, one in April and two in January. The latest two incidents in July 2018 involved tug boat, Sung Fatt 31 towing barge, Sung Fatt 38 loaded with scrap metal while underway in the westbound lane of the Traffic Separation Scheme (TSS) in the western sector of the Singapore Strait on 3 Jul 18; and the other incident involving tug boat, Bintang Ocean 3 towing barge, Winbuild 2313 while underway in the eastbound lane of the TSS in the eastern sector of the Singapore Strait on 7 Jul 18. In both incidents, the masters and crew did not notice the sampans alongside the barges. The perpetrators boarded the barges from the sampans and escaped with scrap metal from Sung Fatt 38 and coils of tow line from Winbuild 2313. The ReCAAP ISC advises all ships to exercise enhanced vigilance and report all incidents to the nearest coastal State. Tug boats towing barges loaded with cargo are relatively more vulnerable as they are slower in speed, with lower freeboard and unmanned barges. 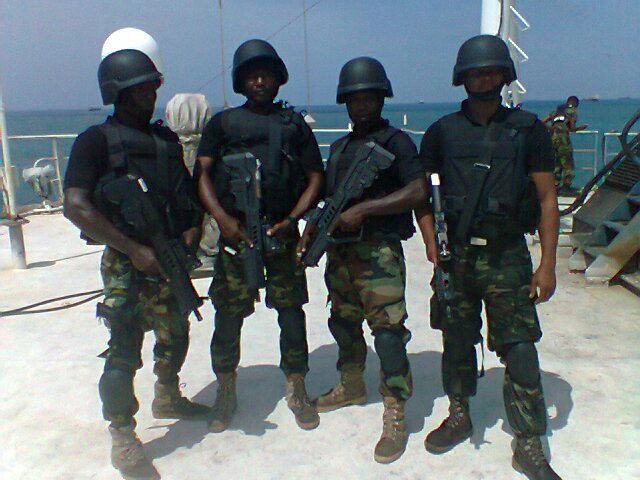 On the part of the authorities, the relevant enforcement agencies are encouraged to beef up their surveillance, increase patrols and render assistance promptly to reports made by victim ships. Tug boats are advised to enhance vigilance with their towed barges. 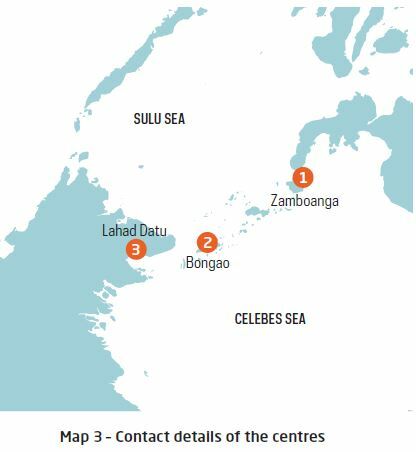 There was no report of actual or attempted incident involving the abduction of crew from ships while underway in the Sulu-Celebes Seas and waters off eastern Sabah in July 2018. The last actual incident reported to the ReCAAP ISC occurred on board Super Shuttle Tug 1 on 23 Mar 17; and the last attempted incident occurred on board Kudos 1 on 16 Feb 18. As of 31 July 18, nine crew is still held in captivity. The Philippine authorities continue to conduct pursuit operations and intensify its military operations to rescue the abducted crew and neutralise the militant groups. Inputs from the Philippine Coast Guard who is ReCAAP Focal Point revealed that the threat is not eradicated and there were reports that the militant groups had been able to recruit and replenish its ranks, and continue to attempt to stage abductions. The possibility of resurrecting maritime piracy and kidnappings is plausible when the opportunity arises given the complex maritime environment of the Sulu-Celebes Seas. 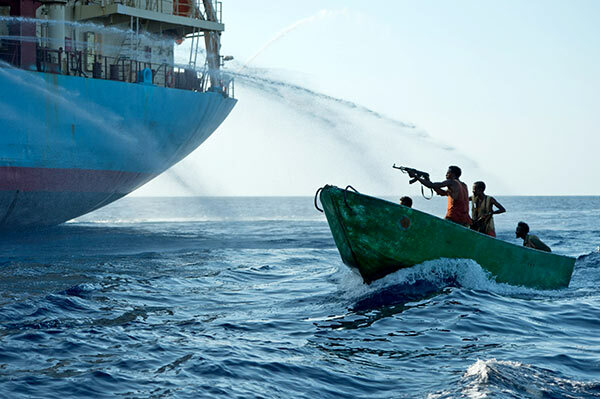 The situation of piracy and armed robbery against ships in Asia during January-July 2018 has improved compared to the same period in 2017. There was a decrease of 4% in the total number of incidents during January-July 2018 compared to the same period in 2017. A total of 47 incidents (comprising 36 actual and 11 attempted incidents) were reported during January-July 2018 compared to 49 incidents (comprising 42 actual and seven attempted incidents) reported during January-July 2017. 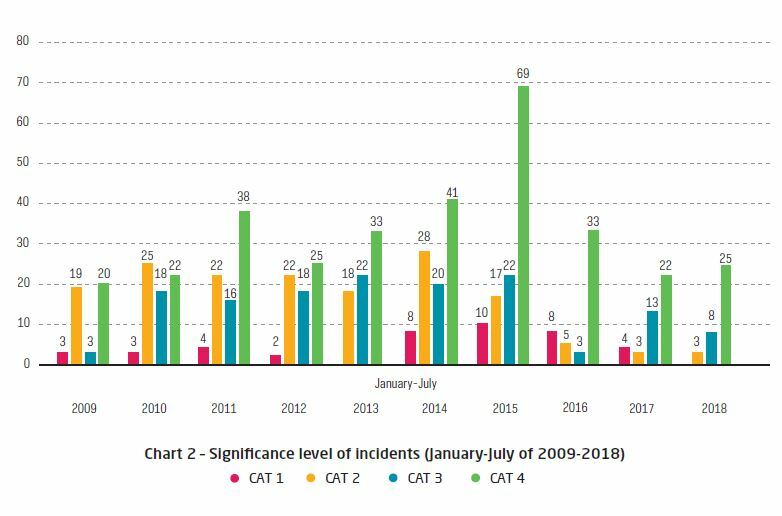 The severity level of incidents has also decreased during January-July 2018 with no CAT 1 incident and the lowest number of CAT 2 incidents compared to the same period of 2009-2018. There was no actual incident of abduction of crew for ransom and no hijacking of ships for oil cargo theft during January-July 2018. However, of concern was the continued occurrence of incidents in the Singapore Strait. Two incidents of theft of cargo from barges towed by tug boats while underway in the Singapore Strait were reported in July 2018, bringing the total number of incidents in the Strait of Malacca and Singapore to seven during January-July 2018 compared to two incidents reported during the same period in 2017. Although there was no actual incident of abduction of crew in the Sulu-Celebes Seas and no theft of oil cargo during January-July 2018, the threat of these incidents still remains. The ReCAAP ISC reiterates the need for law enforcement agencies to enhance surveillance, increase patrols and respond promptly to reports of incident. Ships transiting areas of concern are to exercise enhanced vigilance, maintain look-out for suspicious boats, report all incidents to the nearest coastal State and flag State immediately, and implement preventive measures recommended in the Regional Guide to Counter Piracy and Armed Robbery against Ships in Asia.